Being taught the art of combat at Knights’ School; getting involved with a Maypole Dance; learning about Medieval medicine and how to cure various ailments and hearing stories about Brave Knights in days of yore… the perfect day out for my almost 4 year old and his trusty page. 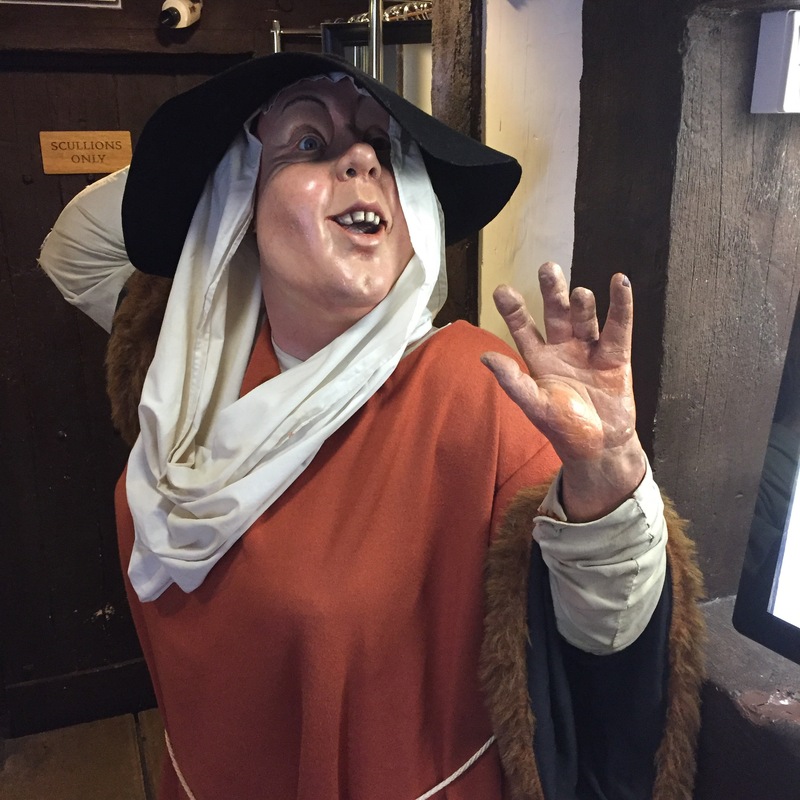 The Canterbury Tales Experience is located in Margaret’s Street, just off the high street in Canterbury, Kent. We had never been before but, having studied The Wife of Bath at A-Level, I was super excited to take the boys. 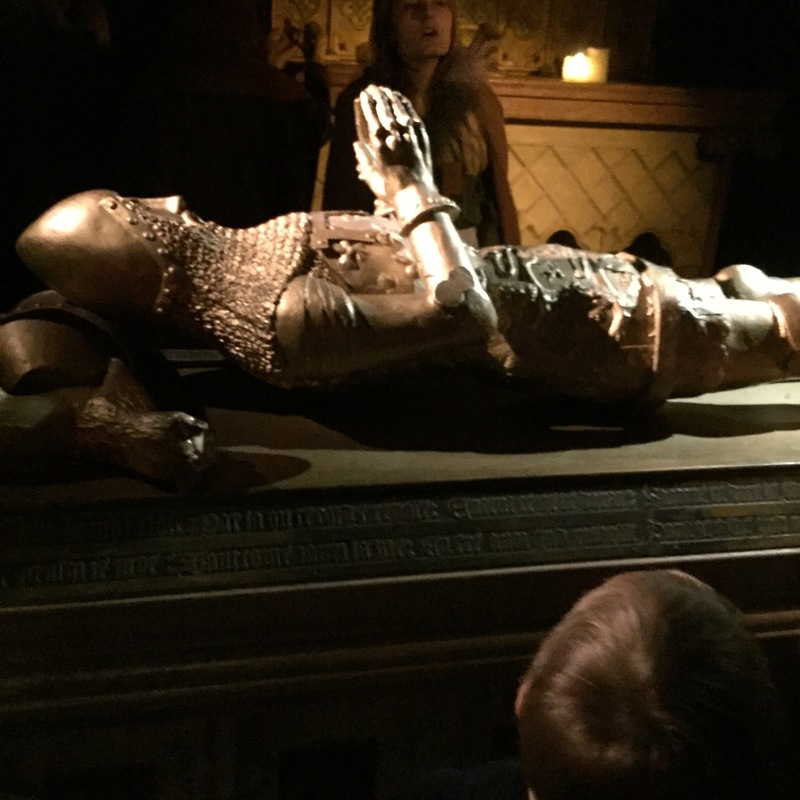 We were warned that the experience itself was aimed at children aged 4+ but big tot (3 & 3/4) was enthralled at the stories and little tot (18m) just loved walking around in the dark. The tour takes visitors on a journey with the pilgrims, from a tavern in Southwark, through the north Kent towns to their final destination of Canterbury. A competition is underway for the best story told en route, with the prize being a free night’s stay in the London tavern on their return. We meet five of the pilgrims and hear their stories: The Knight’s Tale of chivalric love; The Miller’s bawdy Tale of infidelity; The Wife of Bath’s Tale of what women desire most; The Nun’s Priest’s Tale of a rooster and a cunning fox; and The Pardoner’s gruesome tale of greed. The stories are all told on handheld audio guides, and are very good. There is a child’s version and an adults’ version so some of the more bawdy humour is toned down and replaced with bottom humour, from what I could gather from my eldest, who was rolling in the aisles! Our final destination on the journey is, of course, Canterbury Cathedral. We are pilgrims in search of the relics of Thomas a Becket, and we’ve travelled long and hard to reach this most sacred of shrines. 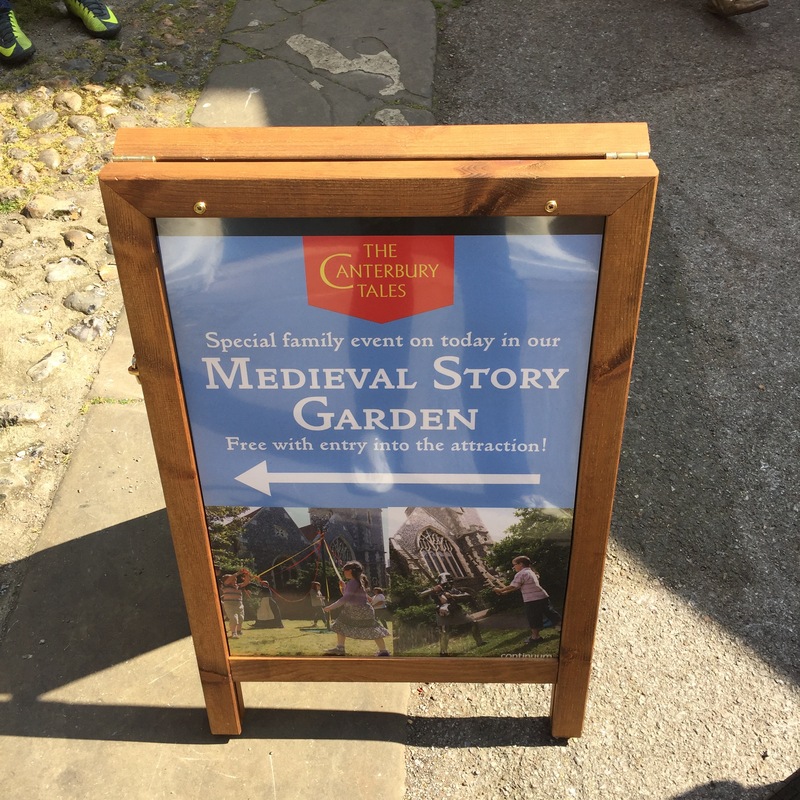 Next stop was the Medieval Story Garden, which opened on 3rd April and its activities will run throughout the Easter Holidays. Inside this walled garden (which is located behind the former church in which the exhibition is housed), we met a number of costumed characters ready to teach us all about Medieval life. 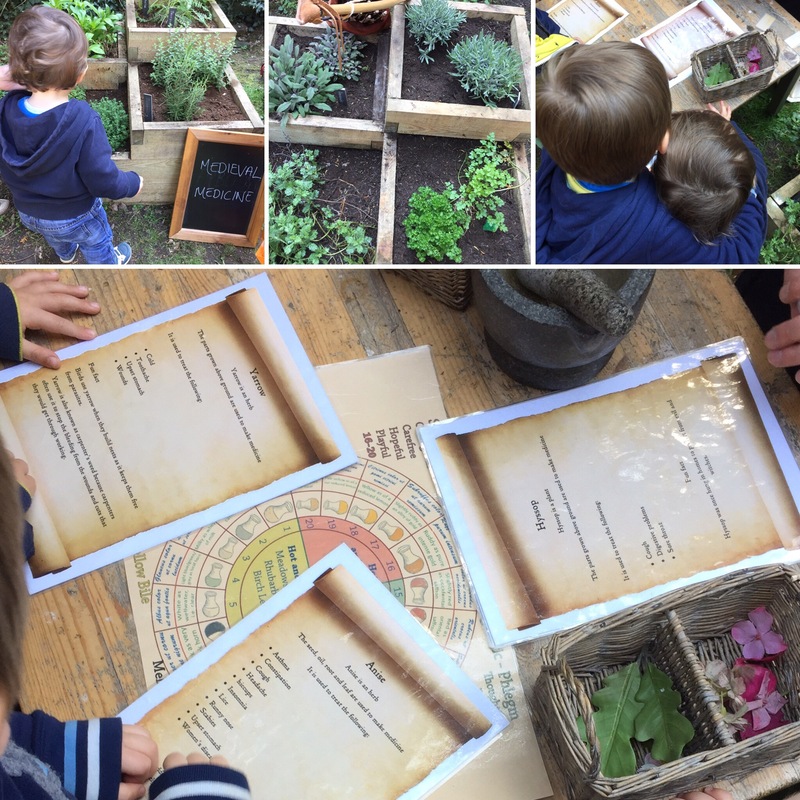 In the Medieval Herb Garden, we met a Herbologist who explained to the boys that Medieval doctors would have tasted your wee to find out what your ailment was. This both horrified and delighted them, with little squeaks of disgust ringing out across the garden. The boys then had cards to work out which herbs might be needed to cure certain ailments, including snake bites, burns and labour pains. 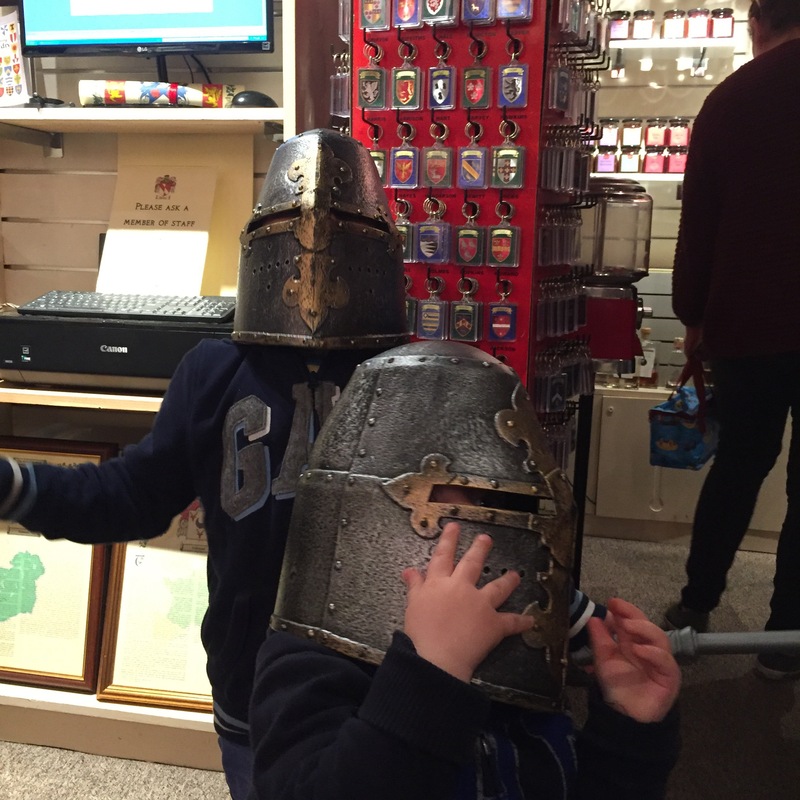 Knights’ School was great fun, and the boys learned how to wield a sword and block an attacker, with varying degrees of success. A bit more practice needed before I let them lose in battle, but they loved the tuition and got well and truly stuck in! The maypole dancing was met with great gusto too and our lovely costumed instructor had to disentangle my three year old on several occasions, after his enthusiasm got him into trouble. Thankfully our fellow dancers were all good humoured and we all got the hang of it in the end. A Story tent was the perfect refuge for a sit down and a little rest. 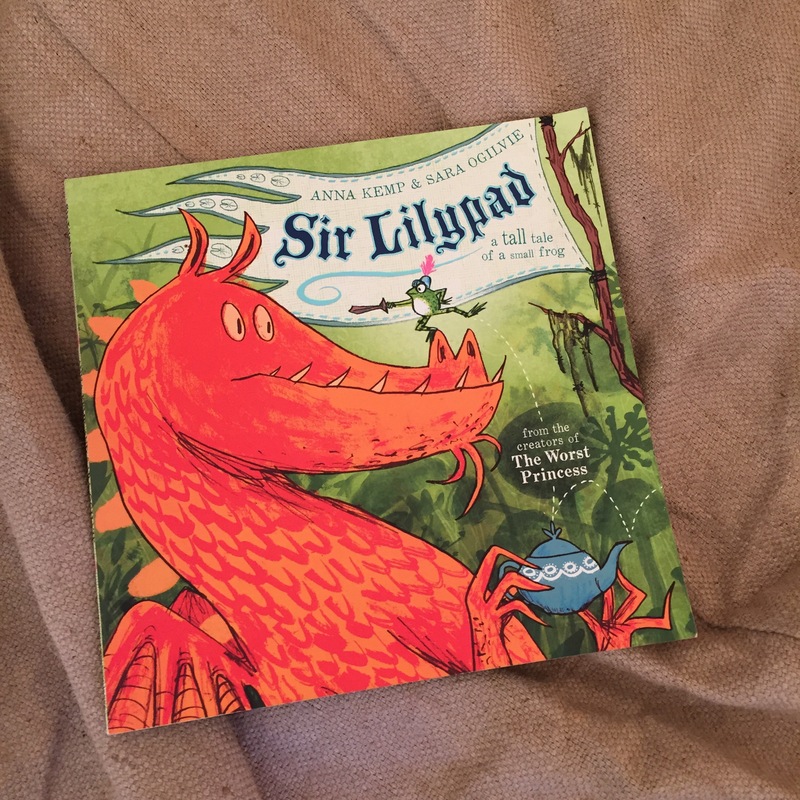 We read “Sir Lilypad” by the creators of “The Worst Princess”, which was about a small frog who longs to be a brave knight and decides that he needs to rescue a princess, but the princess has other ideas. A lovely book and the boys really enjoyed it. The whole experience was thrilling for the boys and one they haven’t stopped talking about since! 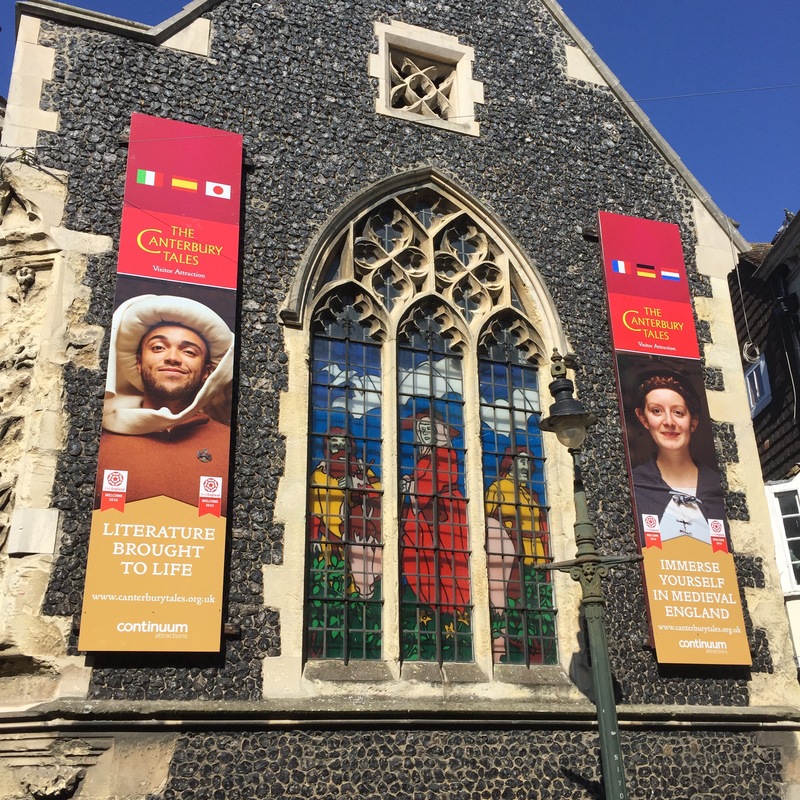 I would definitely recommend The Canterbury Tales Experience for any family interested in history and story-telling, especially those with kids of school age. 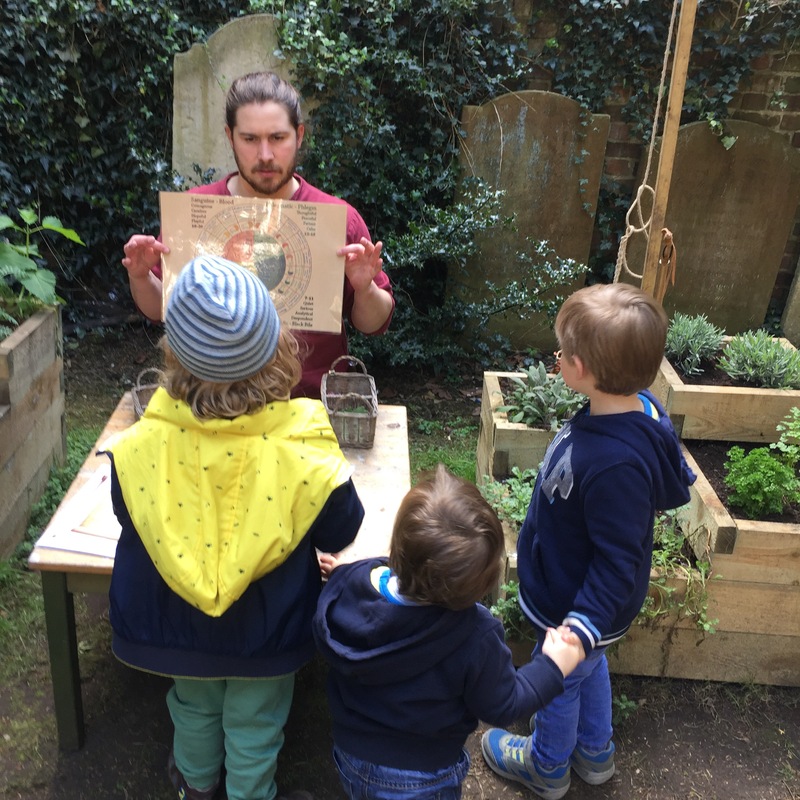 But children of all ages will love the interactive Medieval Story Garden and the colourful characters ready and willing to immerse them in medieval life and to teach them valuable skills along the way. 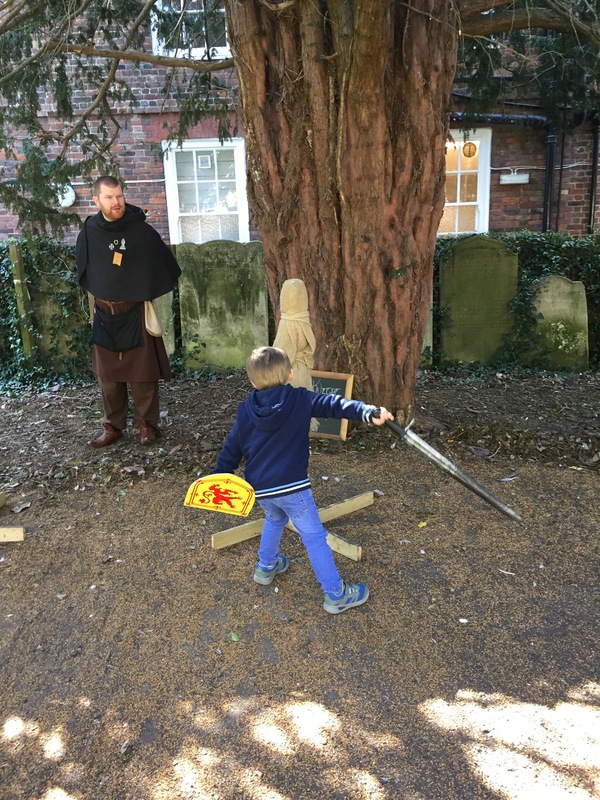 Monday 1st May – Mystical Beasts Learn beast slaying skills, go on a mystical beast hunt and try to master one of the most famous Medieval weapons: the Longbow. 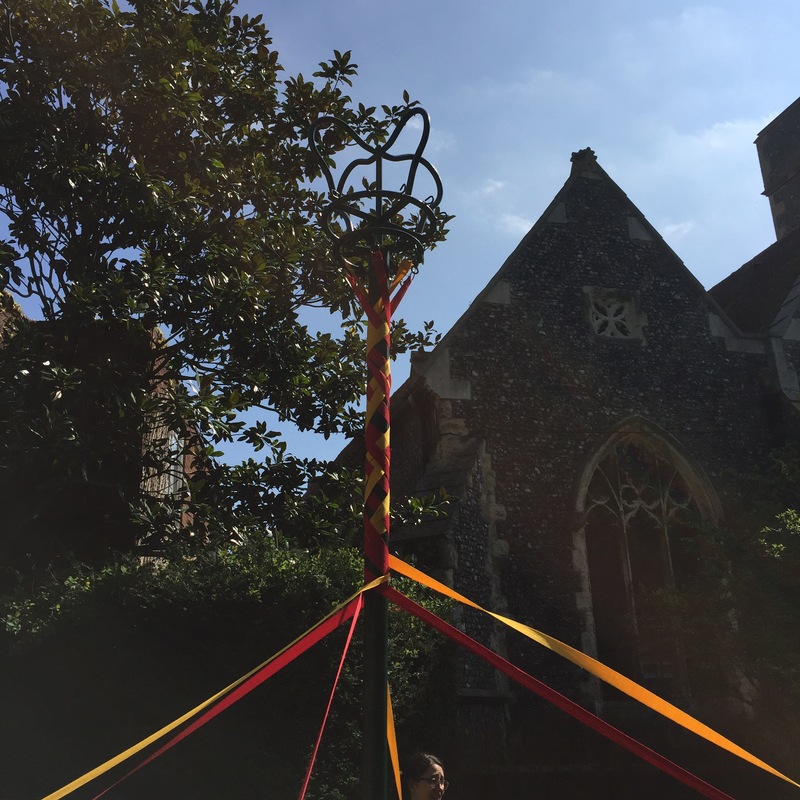 Saturday 27th May – Sunday 4th June – Magical Patterns Participate in hair braiding, maypole dancing, kaleidoscope patterns and a demostration of Astrolabes (a science of astrology which Chaucer, himself, was fascinated with. Saturday 22nd July – Friday 1st September – Summer Maypole Dancing, Medieval Medicine, Story Telling Tent & Knights School. Saturday 16th & Sunday 17th December – Magical Medieval Christmas Enjoy carol singing, meet Santa’s elves, write a Christmas wish to post in the special mailbox and visit Santa’s Grotto – with a gift for every child. Location: The Canterbury Tales, Margaret Street, Canterbury, CT1 2TG. Parking in Canterbury is cheap and easy when you use the Park & Ride Service around the city. £3 all day, including bus travel, per car.